Hills supply a range of alarm system models that will suit all levels of installation required. Their models are 4 zones "R4" also known as NX4, 8 zones "R8" also known as NX8, 12 zones "R12" also known as NX12 and 128 zones "R128" also known as NX16. All our Hills Reliance Kits come with the standard LED keypad but their other specialised code pads such as the TouchNav and VoiceNav available as options on each kit. Hills panels have the added advantage of having an onboard PCB connection for the panel tamper. Having this connection saves one of the panel inputs to connect alarm devices too. Hills have been producing alarm systems for 30 years, and these panels are both robust and reliable. The basic kits support domestic dialling self-monitoring and contact id control room monitoring through the alarm panels on board PSTN dialer. 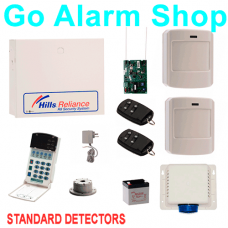 This alarm system can have a generic GPRS/GSM mobile dialer installed with it for wireless monitoring. 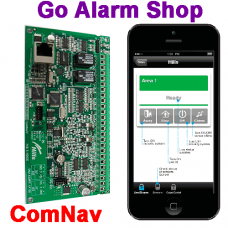 There is an NBN-ready module the ComNav available for the Hills Alarm systems that transform the panel into a useful self-monitoring and control masterpiece through a broadband connection. R4: allows four wired zones and four wireless inputs or 8 wireless zones only. R8 allows a combination of wired and wireless zones to a maximum of 8. R12: allows a combination of wired and wireless zones to a maximum of 12. Note: with the ITI wireless receiver the alarm key fobs use a wireless input. So if you have two ITI key fobs on an R8 panel, there would only be 6 zones left for wireless devices to attach too. All our Hills Reliance Kits come with the standard LED keypad, but their other specialised code pads are available as options on each kit. Hills panels have the added advantage of having an onboard PCB connection for the panel tamper. Having this connection saves one of the panel inputs to connect alarm devices too. Hills have been producing alarm systems for 30 years, and these panels are both robust and reliable. The basic kits support domestic dialling self-monitoring and contact id control room monitoring through the alarm panels on board PSTN dialer. 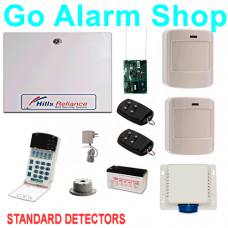 This alarm system can have a GPRS/GSM mobile dialer installed with it for wireless monitoring. There is a National Broadband Network ready module the ComNav available for the Hills Alarm systems that transform the system for unique self-monitoring and control masterpiece through a broadband connection. Hills have an impressive range of security keypads that excel in style and functionality. The standard code pad that comes with the reliance panels, The R4 and R8 kits come with the 8 zone keypad. The R12 and R128 have the 16 zone keypad. An excellent code pad designed with the end user in mind, The LCD touch screen has easy navigation with text descriptions that have removed the need for an instruction manual. The Hills VoiceNav provides voice prompts to navigate and operate the Reliance alarms panel. The code pad will inform the user of the alarms status by voice. The VoiceNav also has intercom capability by incorporating specific wiring configuration. 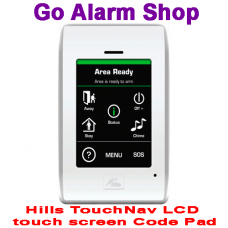 The Hills VoiceNav light code pad provides voice prompts to navigate and operate the Reliance alarm system. The code pad will inform the user of the alarms status by voice. Most of these hard-wired modules pertain to the R128 panel and allow expansion for larger systems and access control. What the main point of interest in this section relates to all reliance panels is the ComNav. The ComNav provides security system self-monitoring through text messaging, domestic dialling and email reporting depending on your house or businesses communication network. The ComNav allows off-site control through a smartphone app called xConnect. This app is excellent for monitored remote control of the Hills security system, and I highly recommend it for self-monitored security. 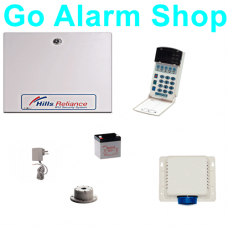 This page has our range of ITI wireless devices that connect to Hills alarm panels that have the ITI wireless receiver connected. Devices include reed switches, movement detectors, and motion detectors with PET immunity to 18kg, smoke detectors, panic pendants and wireless glass breaks. We can supply and fit any of these Hills Security System kits for sale on this site in Sydney, Illawarra .and the Southern Highlands of NSW. To find out more information on the installed prices of these Reliance alarms. Follow the link to our installation website. 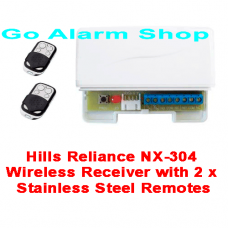 Description The Hills Reliance ComNav module can integrate with all Reliance Alarm panels we se..
S1890A DescriptionNX-304 Wireless alarm control kit with 2 x stainless steel remote controls. The re.. Description Revolutionary alarm keypad design and functionality. Hills have developed a code pa..